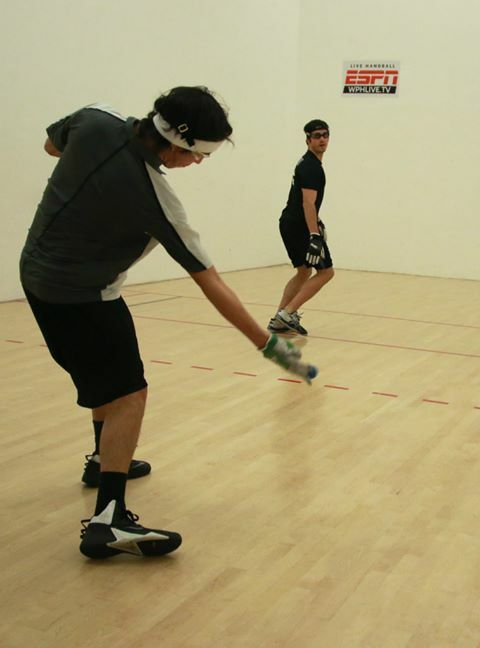 Coming off an impressive past forty-five days of handball, Daniel Cordova (IL), qualifies in Houston at the WPH Race4Eight-January then later goes on to take 5th place; a couple weeks later, qualifies again in San Francisco [takes 7th place]; defeating Erik Torres, Abe Montijo, Marcos Chavez, Chris Tico, and Jon Igesias in that span; Couple weeks later, Cordova [the younger brother of former Elite Eight Pro, Luis Cordova (FL)], heads to Portland, Oregon, for the USHA Collegiate Hall of Fame where he ends up the finalist in the Men’s Open Doubles, defeats former National Finalist, Martin Mulkerrins, in the finals of the men’s singles and anchors his Lake Forrest Team’s bid to be the Men’s, Women’s and Combined Division I Champions for 2014. Just writing all of the achievements over the past 45 days was taxing! DV: What happened in you that created this recent surge? Cordova: I am still trying to figure out what it was and I don’t think I can pinpoint one thing that made my game improve. I believe it was just a combination of playing more often and having a few more visits to the weight room. Playing with my roommate Anthony Collado has helped me a substantial amount too. Every game we play, I spot him some points and we bet a smoothie. For some reason, putting even the smallest stake gives me that extra push during the game. I just transferred that intensity into my tournament matches and it has taken my game to a new level. DV: You have played for a very long time. I remember you at Los Cab during the 06 Nationals. You and brother Luis came into our broadcast booth and spoke to the world. You were about 12 or 13. Do you remember this? Cordova: I can barely remember because of how young I was but if my memory serves me right, that was the year that my brother beat a guy people called Tree in the B finals. Nationals has always been a fun tournament and a tournament in which my brother and I learned so much just by watching the Pros. DV: What has webcasting/broadcasting matches meant to the handball world; especially your family in Mexico, and beyond? Cordova: Webcasting matches has definitely taken the sport of handball to a new level. Now people in my family who would just hear about how my brother and I did in tournaments can actually see us playing live. Whenever either of us gets broadcast, we know that our family is back home watching us and cheering us on. My family is not the only one who enjoys the webcasting, my teammates at Lake Forest College usually meet in a dorm and put my games on a big screen. DV: How has LFC College, Coach Dau and the school shaped your life? Cordova: Lake Forest College was something completely new for me. Living on campus and away from my parents is something that was not easy at first but Coach Dau and his wife Paula both made me feel at home. Before attending LFC I would play handball maybe four times a month and now I play about four times a week. Not only playing handball but also practicing it which was something I had never done before. It took me a while to realize how calling out “Offense” and “Defense” before every shot would help my game but after some time I noticed that it is the little things like those that make the big differences. DV: You just won the collegiate nationals. Putting your name aside greats like Bill Yambrick, Dr Steve August, Fred Lewis, Jon Kendler, John Bike, and Dave Chapman, to name just a few. What does it mean to you to take this title and how would you sum up the whole collegiate nationals experience? Cordova: It is a very good feeling to see that the hard work paid off. Second place is not really something that gets recognized so ending my collegiate career with a win was very satisfying. This is something that I will show-off to my kids in the future. Collegiate nationals was something that I had never experienced before. I had no idea what to expect when I first attended collegiates in 2012. I was able to reach the finals and lost to Martin in a close tiebreaker. I was definitely not expecting to make it to the finals and I am sure it surprised everyone that two freshmen made it. I feel that after the first year, the whole collegiate nationals experience changed. My second year, I felt a lot more people starring at me around the tournament and there was more pressure for me to do well. It was never easy to make it to the finals and it was funny because this last year I had a lot of people tell me that they could not wait to see me play Martin in the final. I just thought to myself, hopefully I can make it to the final. The best word I have to describe collegiate nationals is, unique. DV: What are your future goals? Cordova: First of all, I hope to get a good job in finance once I graduate. For my future in handball, I feel like I still have a lot to improve and I cant wait for next year’s R48 season to start. This year I was not able to make it to the first pro stop in California so I hope next year I can go to every one and hopefully break into the top 8. I still have a lot of work to do in order to make it there. I just want to play well and keep improving my game.